Next off the table is IR21. Again, I have used the Mont St Jean site as the guide and some nice Calpe figures. 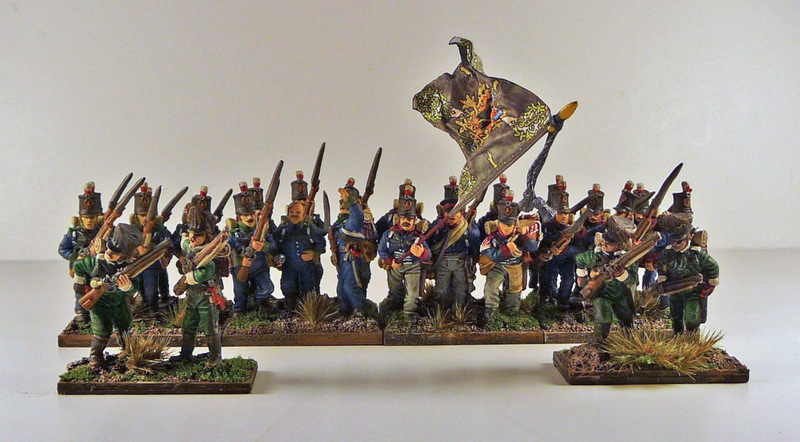 I included IR21 in my Prussian Army as they still wore their British supplied uniform at Waterloo. The unit was brigaded in the II Corps. 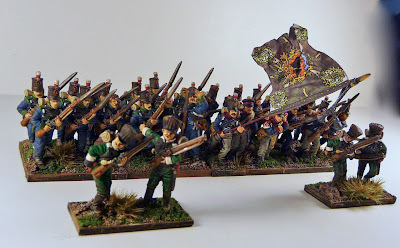 I had bought half the figures a couple of years ago when I was still doing 12 figure units, so I had to add 12 more to bring it up to 24 (I am still considering whether to bring the Prussian musketeer units up to 36, but I have to learn to control myself). Details are everything and without realising it ordered the type b uniform this time when the figures I had were the type a uniform. I decided to paint them accurately so this unit is half 1/IR21 and half 2/IR21. The first battalion has no lace, but has shoulder tufts and is faced green. The second battalion has lace and is faced red. 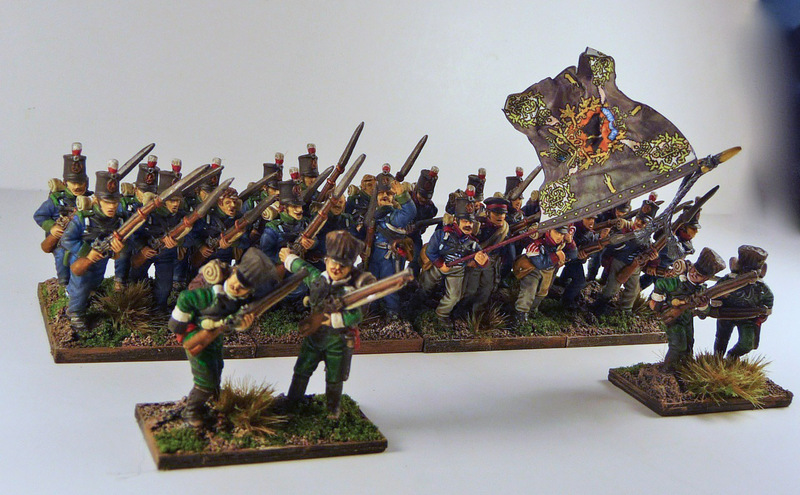 Very attractive units I believe, and I am happy with the paint job. The photos are not great, I thing they look better on direct inspection, but so it goes. 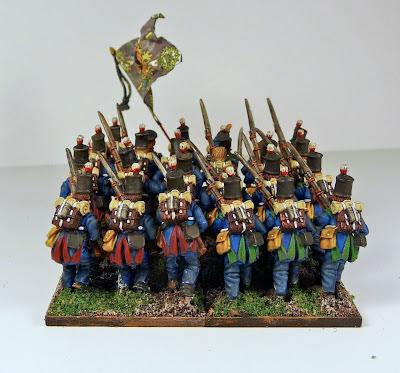 I am still struggling with the blue, I was not really satisfied with my first lot of Prussians, their uniforms are just too blue and I feel they should be more grey. 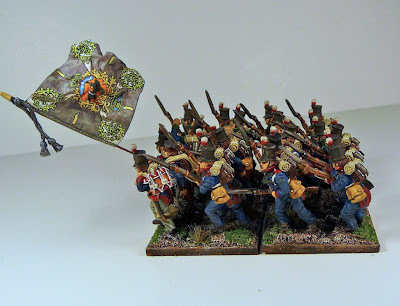 In this unit I highlighted with GW shadow grey, a little better, but not there yet. 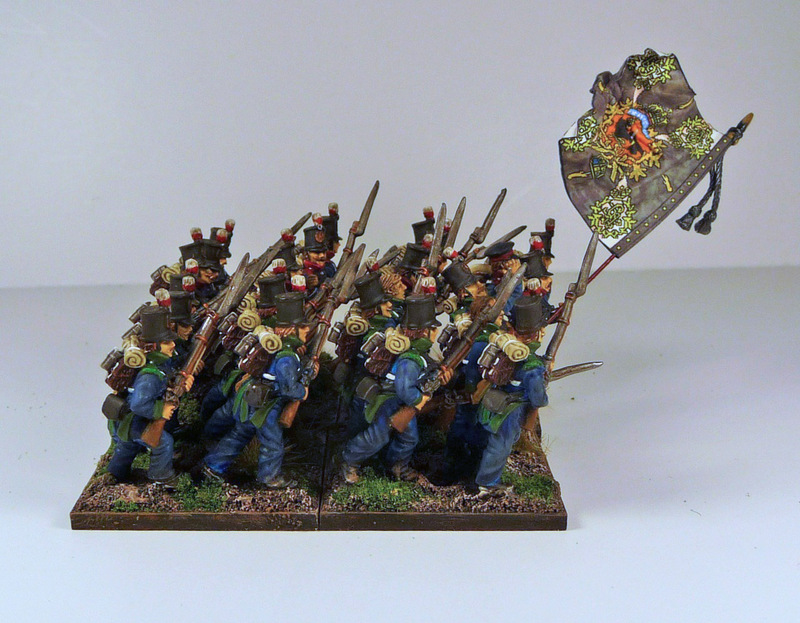 I still have 6-8 infantry battalions to go though so I am sure it will improve. I am tempted to paint 3/IR21 as well as they wore British rifle uniforms. 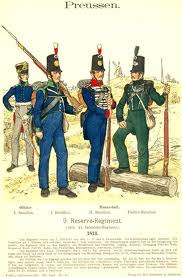 It would be a very nice looking regiment. A couple of variations from the official uniform. I decided to go with white knapsack straps rather then black to make them pop! I also have left off the white piping from the 2/IR21 shoulder straps as I get conflicting information on whether they existed or not. May add them when I paint the next 12 figures. I decided to paint the jaegers with white facings in order to help identify the unit's Pomeranian origin in the Prussian order of battle. The flag is of course is from Flagdude and I believe is for the 2/1st Pomeranian. I used 2 colours on the facings. GW Red Gore highlighted with Blood Red and GW Knarloc Green highlighted with Goblin Green. I like how the drummer came out. Another excellent unit. Very nicely done! They are looking very nice! Very, very nice!!!!! Great painting indeed!! Its a very nice unit, John, well done. Looking forward to more of these. Again a great paintying job! A unit to be proud of. 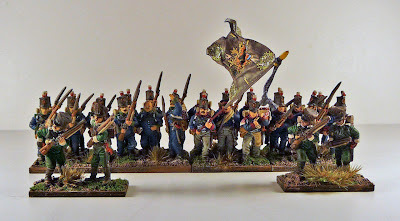 Excellent looking troops, and timely as I will probably add 4 Reserve Regiments to my Prussian army in the second half of this year! I really do like this unit. Very clean Painting on the miniatures.